Densmore under an Indian spell? In the summer of 1906, Densmore did her first serious work on Indian music with the active cooperation of Indians themselves. She attended ceremonies on the White Earth Ojibwe and Prairie Island Dakota reservations. The following summer she started using a device that would distinguish her career as an ethnologist: the phonograph machine. 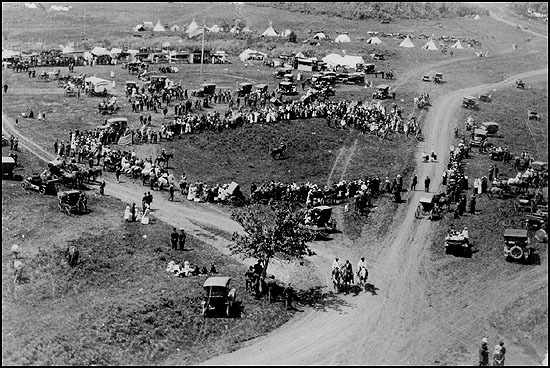 On July 4, 1907, Frances Densmore and her sister Margaret watched the Red Lake Band of Ojibwe celebrate Independence Day. She persuaded a music store owner in Detroit Lakes to loan her an Edison home phonograph recording machine. She recorded an Ojibwe singer named Kitchimakwa (Big Bear). It would be the first of many thousand such sessions. Densmore got the idea of cylinder recordings from Fletcher's work, but Densmore became the more prolific recordist.